Briarwood offers the perfect country escape and just a stone’s throw from the village centre. Surrounded by serene gardens, Briarwood is one of Greytown’s iconic preserved Heritage Buildings. Wyett House is the epitome of boutique accommodation, located on an acre of stunning gardens, just a five-minute stroll to Main Street’s shopping, cafés, and restaurants. Choose from the exclusive fully self-contained two-bedroom cottage (The Annex) in the beautiful garden. Or stay in the Main House featuring two suites with access to the drawing room filled with antique furnishings, an enticing library and dining room. Your hosts Carmel and Stuart will ensure you have a relaxing stay whatever the duration. FreshChoice Greytown ensures that there are fresh flowers every day, but even more so on Valentines Day. Red roses will be available on the day, choose from a single stem or impress your loved one with a good old fashioned dozen! Salute's menu is presented in a “small plates” style that encourages a shared table (how romantic!) and enables the extensive menu’s many fabulous flavours to sample. The wine list highlights some of the Wairarapa’s best, alongside top-class New Zealand and international wines. Bookings recommended. They’re feeling the love at Schoc Headquarters. Treat your loved one to a Pinot Noir Heart. Hand-painted dark chocolate with the colours of love; red and gold, filled with a mixture of Martinborough Pinot Noir and rich dark chocolate. Or how about the Heart Box Selection? 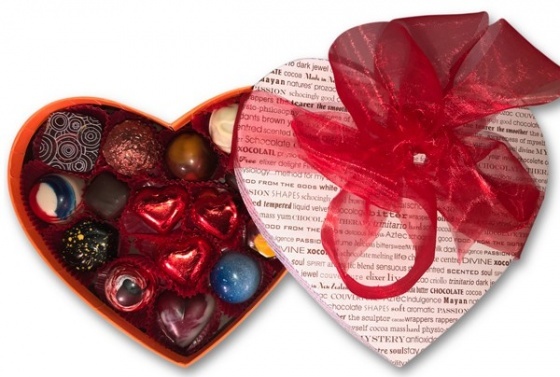 The Heart Box Selection is filled with their chocolatiers choice of assorted chocolates that includes three red foiled dark hearts and three orange foiled milk hearts. The gift of chocolate will appeal to your heart's desire and they may even share some, but don't count on it.